1. Melissa & Doug rules when it comes to chunky puzzles such as this farm animals puzzle. It's perfect for toddler paws that are just starting to strive for motor control greatness. 2. Back in the day, the little four-piece puzzles in this Mother Goose set were a favorite of Violet's. 3. I love the illustrations in eeBoo products and this baby animals puzzle pairs set is no exception. Laurel loved it as a toddler, and so did Vi. The only thing Vi didn't like was the mismatched pairs (babies separated from their mamas), a function of us losing various pieces over the years! 4. This 12-piece Very Hungry Caterpillar puzzle is a great option for fans of the book (isn't that everyone?). Also, the sturdy pieces and carry pouch are perfect for (sometimes destructive) toddlers. 5. I also adore Crocodile Creek products! Jon bought this 30 piece barnyard floor puzzle for Violet one Christmas and it received lots of action. The pieces are nice and sturdy, the animals are beautifully illustrated, and the unusual shape is a nice alternative. 6. 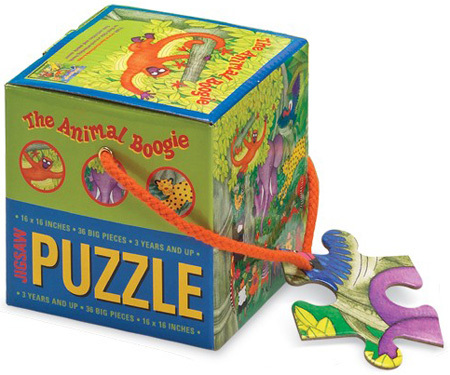 Vi used to sing the Animal Boogie song while working on this 36-piece Animal Boogie puzzle. Totally awesome. 7. This multisided Melissa & Doug pets cube puzzle is a little trickier, but definitely offers a lot of bang for your buck (6 puzzles!) once your child is ready for it. 8. I have done this Around the World 100-piece puzzle about a million times with Laurel and Violet. It’s one of my favorites. 9. 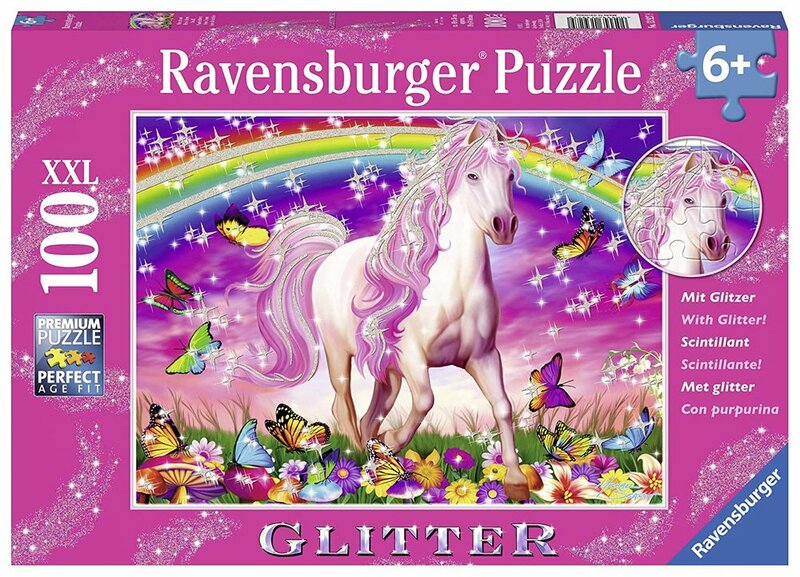 Ravensburger makes great puzzles and this 100-piece unicorn puzzle is perfect for little unicorn lovers. 10. This 200-piece Ravensburger castle fantasy puzzle includes a good mix of elements to hunt down. 11. Introduce your kids to fine art (and a family challenge) with this Starry Night 500-piece puzzle. 12. Get ready for a bunch of Springbok puzzle picks because they are awesome! When your family is ready to tackle 1,000 pieces, this balloon bonaza puzzle is a fun option. We've done it several times! 13. Not surprisingly, Laurel loves this candy galore puzzle. The unusually shaped pieces make for a fun challenge. 14. Aside from the fun of assembling this 1,000-piece cupcake puzzle, Laurel and Violet both like talking about the cupcakes. The mini-poster that comes with this puzzle became Violet's "menu." 15. Laurel and Violet routinely call dibs on different chocolates when we break out this chocolate artistry puzzle. 16. I didn’t realize Mudpuppy made big puzzles until I saw (and bought) this awesome Cool Cats puzzle. We loved doing this one over the holidays!